And here we are, Christmas Eve! We’re rounding the Christmas Craft Collective up (for this year) with a lovely tutorial from my wonderful friend Alex Bartholomew, owner of Bluebird Fabrics. She’s a creative genius but is also really good at making things accessible, as you shall see! You may be all set for this year, but save this for next year…or indeed, attempt other shapes and let us know how you get on! 1. 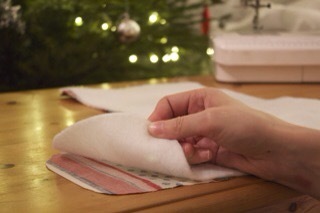 Draw a stocking – about 2 or 3 centimetres bigger than the size you’d like to end up with – on your wadding. 3. 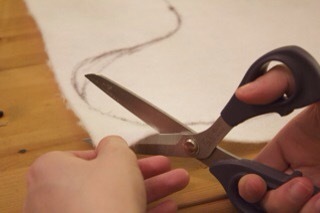 Place the wadding on top of your fabric and cut around it so that they’re the same size. 4. 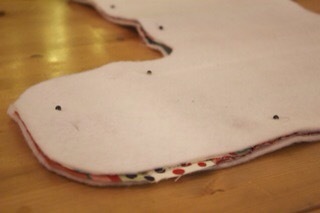 Pin the fabric and wadding together and sew around the edge- about 1 centimetre or 2 from the edge is just fine. This is the front of your stocking. 5. Place the front of your stocking on another piece of wadding face down so that it produces the same shape but the toe points the other way. Repeat steps 2 to 4. 6. 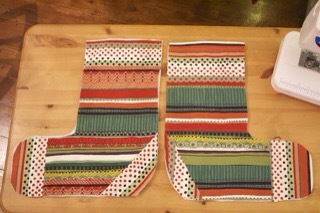 Pin the front and back of your stocking together with the fabric sides touching and pin in pace. Sew around the edges- again just leave about 1 or 2 cm around the edge. 5. Turn the stocking inside out. You’re nearly there! Open up and unfold the bias tape. On the inside you’ll notice there are two folds- one wider than the other. Flatten it out and pin it to the very top of the outside of your stocking with the edge of the binding in line with the raw edge of the stocking. The narrower fold should be at the top in an ideal world. Sew along that narrow fold. Wrap the bias binding over the top of the stocking so that it folds right around into the inside. 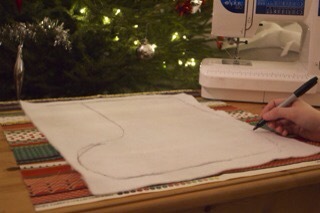 Turn the stocking inside out again and sew along the back of the bias binding. 7. Add a little handle if you like, too, by sewing together some of that extra bias binding and hand stitching it in the inside. Congrats! 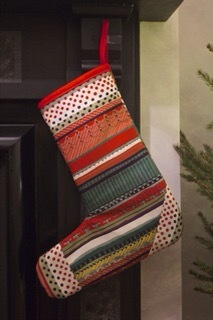 You’ve made your very own Christmas stocking!